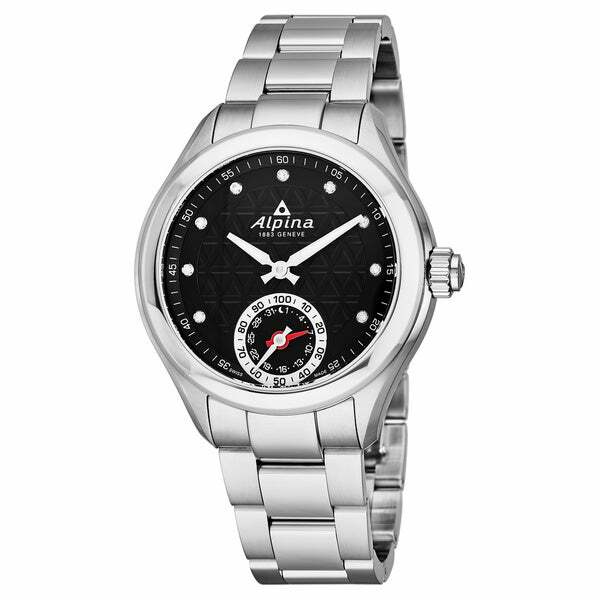 Alpina Geneve is a Swiss manufacturer of accessible luxury watches and is an independent company based in Geneva, Switzerland. Founded in 1883, Alpina continues to develop highly distinctive and attractive collections with a real sporting pedigree. The Horological Smartwatch: the bridge between Silicon Valley and the Swiss watch industry. Powered by MotionX , the Swiss Horological Smart watches are capable of bi-directional communication with iPhone and Android apps. The Swiss Horological Smartwatch is the synthesis of high-tech innovation and traditional Swiss watch craftsmanship; it is the link (no pun intended) between modern and classic, and the bridge between Silicon Valley and Switzerland. There is no digital screen on the Swiss Horological Smartwatch. Instead, the beautiful laser cut hands on the watch dial display information in analog form. The Swiss Horological Smart watches retain their natural classic beauty and can deliver the benefits of the quantified self, all without ever having to recharge a battery. The Swiss Horological Smartwatch synchronizes automatically with applications on Apple and Android smartphones. On the iOS and Android apps, simple and easy-to-understand graphics highlight how much one has moved and slept during the day, week, or month. The Swiss Horological Smartwatch now combines the features and functionality of the MotionX technology platform with a luxury timepiece.